After a series of contentious congressional town hall meetings made headlines across the country this week, Vermonters were left feeling neglected by the absence of their own elected representatives. Left with few options, voters were forced to improvise a way to hold a meeting of their own. 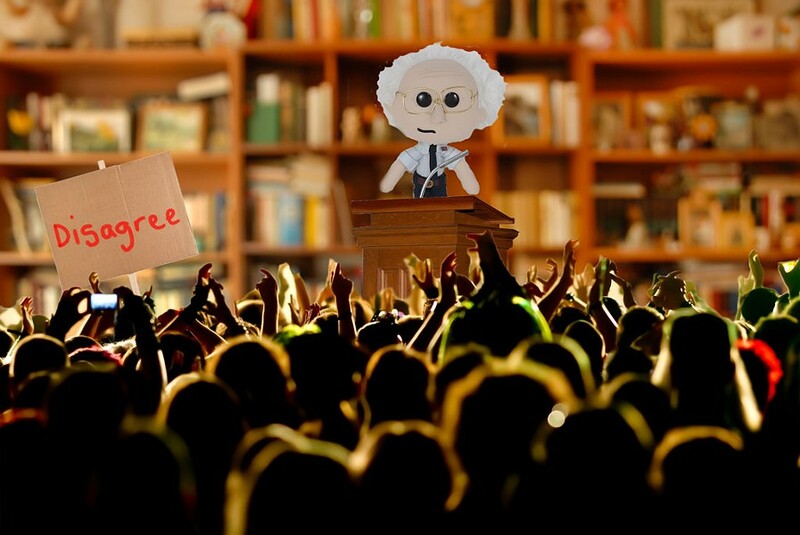 At a packed Fletcher Free Library in Burlington on Friday, a crowd of constituents spanning the entire political spectrum presented a wide range of challenging questions to a stuffed doll closely resembling Sen. Bernie Sanders (I-Vt.). Unlike other recent town hall meetings, the participants showed very little interest in the future of the Affordable Care Act or making sure that Vladimir Putin receives the credit he deserves for the outcome of the 2016 election. Perhaps owing to the fact that Sen. Sanders is now a national figure whose policy positions have remained remarkably consistent for decades, the crowd seemed more inclined to ask the doll general but difficult questions about the current state of politics. “Does Capitol Hill have separate bathrooms for lawmakers who defend admissions of sexual assault as locker room talk, or are they only broken up by gender?” inquired Aleisha Nuclee of St. Albans. “My daughter would really like to become president some day, but she barely speaks any Russian. What advice can you offer her?” asked Jeanette Bennet of Bennington. “Have you noticed that Mitch McConnell only schedules his vacations during tortoise mating season?” asked Veronica Pestile of Newport. “Rather than giving Ted Cruz free airtime, did you ever consider just having a healthcare debate with an empty trash bag?” wondered Peter McDeeter of Stowe. “Shouldn’t Fox News be marked classified and barred from public view now that it has become the President’s primary source of intelligence?” asked Shelia Corningbluff of Enosburgh. Every question was met by sustained silence from the Sanders doll, who seemed more keen on listening than trying to provide answers. Despite the noticeable lack of responses, the meeting remained a mostly peaceful affair. That is until someone inevitably brought up the Burlington Town Center mall redevelopment. “Why haven’t you used your celebrity status to bring national attention to our diminishing views of Lake Champlain? !” Nancy Fortmorger of Burlington demanded to know. “I dunno, maybe because he has bigger fish to fry? !” responded fellow attendee David Diddly. “I’m more progressive than you are!” shouted another random voice from the crowd. At some point during the heated exchange, the once homogenous crowd divided itself into two factions. On one side of the room were constituents convinced that the Sanders doll was fiercely opposed to the construction of a 14-story mall. On the other were those who interpreted the doll’s silence as an indication that the senator didn't feel the need to form an opinion on the issue. Amidst all the shuffling, the crowd didn’t seem to notice that the Sanders doll had already left the meeting, likely trying to avoid becoming the subject of another town hall viral video.